AAA - US AIR FORCE Art Casket Click on the photo above for a larger photo & order form! locations. CALL US at 1-800-550-7262 now! Honor the time and sacrifice that they gave to the good old USA. portray the dignity of our US Air Force. a stirring way to elevate their memory. all sides for easy carrying with antique nickle plated hardware. you wish something else, CALL US at 1-800-550-7262 for answers! an example sent to you. AAA - US ARMY Art Casket Click on the photo above for a larger photo & order form! Cemetery consulting available upon request. our personal freedoms by sacrificing so much of theirs. for a sample to be sent to you! Standard shipping(1-5 days depending on location) is $125 - $350. Click on the photo above for a larger picture & order form! Proudly MADE IN AMERICA! Keep Americans working! selection! Truly a breathtaking display. through the sky in the missing man formation. crepe, pillow with full tailoring provide a dignified viewing. NOTE - full art graphic Head Panel available for additional $295. Ask for an example sent to you! Standard shipping(1-5 days depending on location)is included. AIR FORCE HONOR STEEL CASKET Click on the Image for a larger photo of the casket! 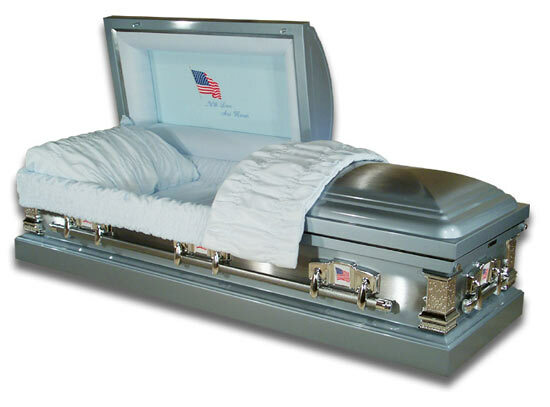 casket which is made right here in the United States.BUY AMERICAN! same casket complete with a metal foot panel & blanket. chrome pin striping accent on the top lids. Free at 1-800-550-7262 for answers to your questions. Flag panel is shown but there are other choices also. U.S.Veteran. ALL AVAILABLE AT NO ADDITIONAL COST! it is not noted, the flag panel shown will be used. Standard delivery(1-5 days depending on location)is $125-$350. Overnight or Next Day shipping available. we can quote this to you. Personalized with United States ARMY! is on all the edges of the hand tailored fabric. $195 is a 6in emblem on the throw! all around. Complete with a gasket and sealing hardware. is available for an extra charge. Call for quote. Veterans Honor & Tribute - Solid Poplar Wood Click on the picture above for a larger photo! Give HONOR & TRIBUTE for your loved one who sacrificed so much. us NOW to order this casket - 1-800-550-7262. - COAST GUARD - NATIONAL GUARD! Custom fabric & trim! with enhanced molding and size. This proud casket is Solid Poplar with a rich dark Mahogany stain. appearance worthy for any US Veteran. is truly a tribute for any Veteran! available for an additional charge. Call for a quote.